iSALUS Healthcare offers cloud-based, EHR, Billing & Scheduling and Billing Services solutions for physicians, hospitals and healthcare systems. Bringing together the benefits and functionality of a complete Electronic Health Records, Practice Management and Patient Portal solution into one flexible, intuitive cloud-based application. iSALUS gives busy providers and staff the freedom to practice medicine their way. An all-in-one EHR, Billing and Scheduling solution requiring only a single login to access all parts of the system. iSALUS provides physicians with the flexibility to review patient information and e-Prescribe securely with any web-enabled device, making vital patient information accessible on Windows Phone, iPad, iPhone and Android devices. The program stores data in the cloud which it then protects with 128-bit encryption to maintain compliance with HIPAA regulations. iSALUS’s integrated charting, workflow management and scheduling features help physicians and office staff optimize patient flow while providing quality care. It also includes a dynamic patient portal that allows patients secure, web-based access to medical records, lab results and appointment requests. OfficeEMR is fully HIPAA compliant and helps physicians qualify for Meaningful Use certification in three months. iSALUS’ EHR program is Drummond Certified™ as a Stage 2 Meaningful Use Complete EHR Ambulatory Provider. 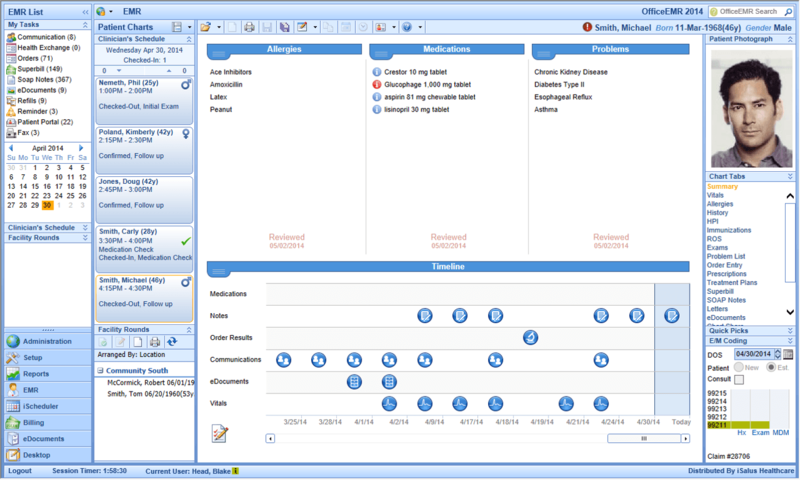 iSALUS offers practices a flexible, feature-rich and fully-integrated EHR solution. Dr. Christopher Bojrab, President of Indiana Health Group, choose iSALUS for his offices. “We needed to have an EHR system that was extremely flexible – one that could be adapted to several sub-specialties and allow us to share information among and between clinicians. The iSALUS team showed us that it can be done, and done well,” he said. Learn everything you need to know about iSALUS OfficeEMR. Our experts will reach out to you shortly.